Shaved ice is the best in Taiwan, especially since it's so hot and humid here and you need something to cool you down. It's usually pretty cheap, lots of selections and lots of places to find it. However, there has been a lot of news lately about how it's not so safe to eat- you don't know where the water is from where they make the ice, you don't know if the ice blocks have been on the ground, etc etc. But I generally stick to places that have a lot of customers and check if their toppings look fresh. My personal favorites to put on shaved ice, besides Mango & condensed milk, are rice balls, lemon jelly, green or red bean, sometimes boba and almond jelly. One very popular shaved ice place is ICE MONSTER which not only serves shaved ice with various combinations of fruit, but also tops it with ice cream/sorbet! My sister loves the shaved ice here, and apparently it's pretty famous or trendy. It's usually quite busy and they've expanded beyond their original location on Yong Kang Street. I ordered the trio fruit combo and requested the lemon sorbet instead of the mango sorbet. The generous portions of mango, kiwi and strawberries were all coated with evaporated milk, and then the mountain was topped with a big scoop of sorbet. The fruit was kind of sugary as maybe they were soaked in syrup already and the strawberries were probably frozen and defrosted. You can also get just one fruit, and mango shaved ice is very popular. The trio ice was $150 NT or about $5 US. It's definitely pricey for shaved ice- you can usually find it for $40-$60 NT and sometimes for $30 NT plus $5 NT for milk. 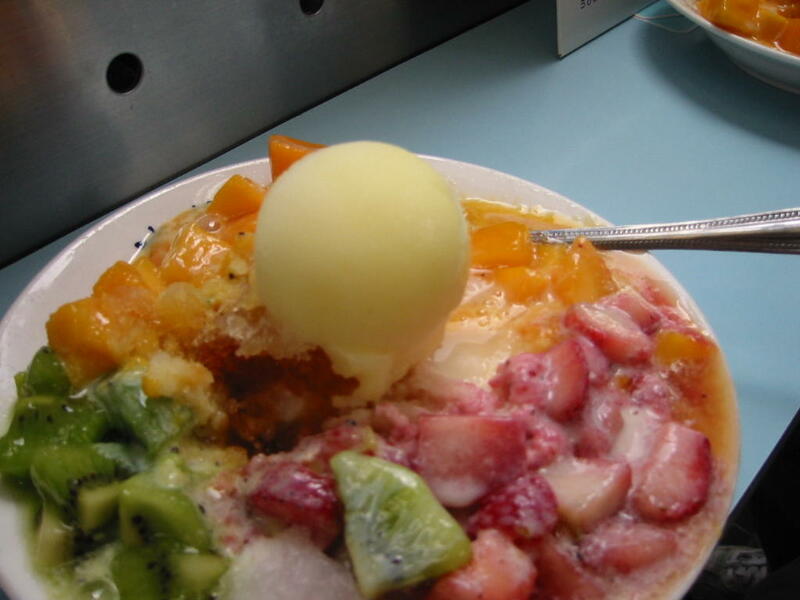 Depends on where you get it- I had quite decent shaved ice in Hsi Men Ding for $35 NT with all you could select sides on your plate, and the mango shaved ice with rice balls at IDEE mall was really good. The atmosphere is busy and crowded- you usually have to start looking for a seat while you are in line. You sit on stools along the countertops and tables in front of the ordering section, and try and eat your shaved ice before it all melts. The sorbet on top and ice quickly melted into a puddle, which some people enjoy, but I personally didn't like. I personally think Ice Monster is a bit overrated and overpriced, as everything is too sweet and I didn't even eat more than two bites of the sorbet. It ends up being sugar sensory overload, when you are just looking for the refreshing taste of shaved ice. But if you are sharing with friends and like all those fruits and sorbet, then it's a fun experience to try. Anywhere in the world- you're going to be hungry. But what are you looking to eat? For me, living in Los Angeles grants me the luxury of eating anything I want almost anytime I want. I accumulated a lot of my favorites- local hotspots, mainstream places, hole in the walls and a variety of tastes- Indian, Japanese, Mexican, American, Italian, Chinese, Californian- you name it, you can probably find it in LA. So traveling back and forth over the Pacific- I miss my favorites- enchiladas, waffles, pastrami sandwiches, french fries, carnitas tacos, chinese chicken salad, spicy tuna rolls, chicken pesto sandwiches with arugula, CPK pizza, asian fusion. So not that Taipei doesn't have awesome food- it does, but it's another new journey to find out where and trying it out. So this is my little journal of my journey of finding foods I love in Taipei. The basics- dumplings, mango shaved ice, beef noodle soup, boba ice tea- you can't go wrong with most places. But where to find in Taipei - good thin crust pizza? Mexican food? The perfect salad? Minestrone soup? Tandoori chicken? American breakfast? Hopefully- I'll find some new favorites and meet other hungry people in Taipei! PS- if you are visiting LA, some of the things/places i miss eating when i'm not there, in no special order!